Clear color. Aromas of lime leaf and plumeria with a syrupy, lively, sweet medium body and a peppery, medium-length fresh lime cordial, daiquiri, galangal, and condensed milk finish. Kaffir lime leaf flavors in this mandarin vodka make this an interesting choice for cocktails. Bottom Line: Kaffir lime leaf flavors make this an interesting vodka for cocktails. 92 • Rock Town Vodka 40% (USA) $13.99. 94 • Rock Town Basil Vodka 35% (USA) $13.99. 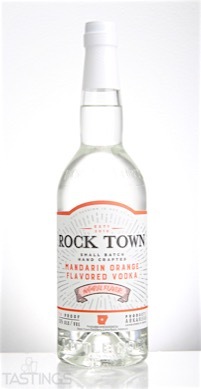 86 • Rock Town Mandarin Vodka 35% (USA) $13.99. 89 • Rock Town Grapefruit Vodka 35% (USA) $13.99. 85 • Rock Town Arkansas Bourbon Whiskey 46% (USA) $34.99. 92 • Rock Town Arkansas Bourbon Whiskey Peated Malt 46% (USA) $39.99. 93 • Rock Town Arkansas Bourbon Whiskey Golden Promise 46% (USA) $39.99. 85 • Rock Town Arkansas Bourbon Whiskey Chocolate Malt 46% (USA) $39.99. Since Vodka tends to be a neutral spirit, it lends itself to blending with flavors and fortifying other beverages. In the 19th century, high-proof "Russian spirit" was held in high esteem by Sherry producers in Spain, who imported it to fortify their wines. 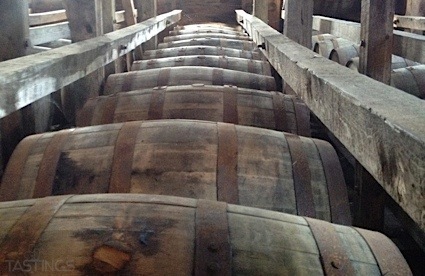 Neutral spirits are still used to fortify Port, Sherry, and other types of fortified wines, although the source of alcohol for such purposes these days tends to be the vast "wine lake" that has been created by European Union agricultural practices. Flavored Vodkas have been produced from the start, originally to mask the flavor of the first primitive Vodkas, but later as a mark of the distiller's skill. The Russians and Poles in particular still market dozens of flavors. Rock Town Mandarin Vodka rating was calculated by tastings.com to be 86 points out of 100 on 2/24/2017. Please note that MSRP may have changed since the date of our review.